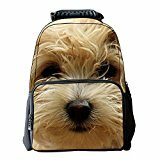 Boasting a sturdy 1860-denier polyester and felt fabric construction and a personalized 3D animal face pattern fashion design, this series of 3D Animal Print backpack easily and comfortably carries your gear for a long time. The utilitarian pack offers a single main compartment and a front pocket with an organizer, giving it enough space to store two to three textbooks, a large binder, two to three spiral notebooks, several paperbacks, a calculator, pens and pencils, a bag lunch, a cell phone, and an MP3 player–all without breaking a sweat. In addition, the 3D Animal Print backpack is comfortable enough for a full day of striding from class to class, with straight-cut and padded shoulder straps for cushioning comfort. What’s more, it’s also a good companion for short trip, weekend getaways and other outdoor activities. Thanks for your business! We will always strive for 100% customer satisfaction. Your positive feedback will be greatly appreciated! If you have any question, please do not hesitate to contact us immediately and we will give you a satisfactory reply within 12 hours.